I have been a fan of waxing rather than shaving my legs and underarms for many years. I loved it when I could afford to get hair removed by a laser, but beyond the expense it is time consuming and not always convenient. Then I discovered the Panasonic ES-ED90-P Ladies Wet & Dry Epilator and fell in love! I literally fell in love (we are married now) and moved to San Diego where the weather is nice all the time and my legs are bare most of the year. Shaving everyday got tiresome and having to suffer through days of stubble until it was long enough to get waxed was not cutting it either. I got a glowing recommendation for the Panasonic ES-ED 90-P Ladies Wet And Dry Epilator and decided to give it a try. If you are new to epilating this is the Panasonic epilator for you. Epilating is a lot like waxing as it pulls the hair off your legs, bikini area, underarms, where ever, by the root! It is more painful than waxing, so beginners beware, but the results are fantastic and last a lot longer. The Panasonic Epilator ES-ED 90 comes with a lot of attachments. The very best one is the beginner cap because it eases you into this new hygiene process. I foolishly skipped it when I made the first pass up my leg with my Panasonic ED-90 and almost passed out from the pain. After some deep breathing I put the beginner cap on and it was a lot less painful. Now I always use the cap for the first round of epilating and then finish without out it. Another great reason I highly recommend the Panasonic ES-ED 90 epilator is that it comes with a great little attachment to exfoliate your feet! If you wear sandals all the time like I do now and want your feet to look good this is an excellent attachment. Just pop it on and go to town on calloused heels to keep them looking smooth. Wet/Dry – This is great feature because it is more comfortable for me to epilate in the shower and I can take it with me anywhere without worrying about finding a socket to plug it in. If you are a girlie-girl like me then you will appreciate that the Panasonic epilator ES-ED 90-P comes in pink and white with a nifty pouch to keep it all together. The only drawback for me is that it does not work very well on my underarms. I find it awkward to hold the skin tight enough to keep the tweezers from pinching me there. I think it’s my technique more than the epilator, though. I usually only manage to get half the hairs out and end up shaving the rest down. I am quite happy with my epilator, but my friend was not. I checked the Panasonic ES-ED 90-P reviews after she called to complain and found that she was not alone. She has super thin, fine hair all over her legs (not like me) and the epilator just could not seem to get a grip on them. A few other users reported the same issue, so this model works best for the really hairy girls like me, I guess. Overall you will probably be very happy with a Panasonic ES-ED 90-P Ladies Wet And Dry Epilator. I love the beginner cap and that I can use it in the shower to make it less uncomfortable. You will love the way the foot care head because of how it makes your heels look after a good scrubbing, too. The price is right, especially when you consider that it comes with so many attachments that you would have to order separately and pay extra for. Not sure if the Panasonic is the right epilator for you? Check out the contenders for the best epilator for women of 2016? If you want smooth legs without shaving everyday then an epilator might be right for you. With so many to choose from you can quickly get overwhelmed trying to decide what brand to get and with what accessories. I can help. Braun is one of those companies that has been around since the stone age and they offer a huge variety of products, which explains why every device has such a long name. They have been in business so long because they make high quality products that work. The Braun 7181 Epilator is one such product. If you are new to epilation for personal grooming then here is some quick information to get you ready for a whole new personal grooming process. An epilator removes hair by pulling it out from the root. It’s a lot like waxing, but a whole lot less painful and more effective. The Braun 7181 Silk Epil Wet and Dry Epilator is the perfect first epilator because of it’s features, reliability and wallet-friendly price. This is a very basic model epilator from the Braun line but it gets the job done. The best feature on this particular model is that it can be used wet or dry. This type of versatility and portability make it easy to take with you and use anywhere. You are not tethered to a wall outlet. The other feature the Braun 7181 Silk Epil Wet Dry offers that makes it a best buy is the two speeds you can use it at. If you are new to using an epilator I highly recommend the low speed until you get used to the sensation. However, when you kick it into high speed, it might be a bit more uncomfortable at first (and loud, but don’t be alarmed, that is normal) but it removes hair really fast, even the super short ones, in record time. Before you commit to any epilator it’s a good idea to read what other users are saying about it. I have found that the Braun 7181 reviews are consistently favorable. The chief complaints are that it is loud, that it’s not good for under your arms and that their customer service is bad. Well, it is loud, but not deafening and you get used to it. There are attachments for the bikini area and underarms but you have to order them separately. Honestly, it is just a matter of getting used to using it on the more delicate areas and with the lower speed. I have never had a problem with my Braun 7181 so have never used their customer service. I have read about other users ordering from Amazon.com, and I have always loved the service I got from them. 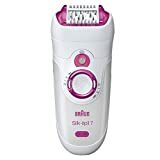 There are certainly other epilator models from Braun and other companies, but the 7181 Silk-Epil Epilator is a really good buy for the money and beats the constant hassle of shaving everyday or paying for waxes every week or so. Once you get used to using it and having smooth hair free legs and other places for up to two weeks at a time, you will wonder how you ever got by without one. In my quest for a smooth and hairless body I have tried every hair removal product and device under the sun. Some companies just make better products than others and Braun is one of them. 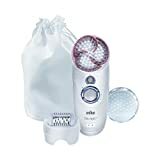 The Braun Silk Epil Female Epilator se7921 spa hair removal device is the latest and greatest way to get rid of body hair and leave you with glowing skin and more free time. If you are new to the term epilator, it just means removing the hair by plucking it out from the roots as opposed to shaving, which just cuts it off. Epilating is closer to waxing, but in my opinion, a lot less painful and the results last a lot longer. Waxing is extremely painful to me. The home wax kits don’t do a good job on a lot of areas of the body and there is a lot more preparation and clean up involved. Yes, the name is long, but the product makes “short” work of unwanted body hair. It efficiently removes stubble from your underarms, bikini line and the entire leg. I have read reviews from people who use it on their face, too. I don’t, only because I have no need to. One of the best features on Braun Silk Epil 7921 model is the firmness and density of the exfoliating brush. It is especially important to exfoliate when you use an epilator to remove hair because it lessens the risk of ingrown hairs. Plus it leaves you skin soft and almost glowing when you are done. If you are shaving your unwanted body hair, you are doing it a lot, like everyday, for some. If you wax, then you are spending a lot of money and time to travel to get it done. Waxing at home is messy and never as effective as a pro can do in a salon. Using the Braun se7921 model to remove hair will give you smoother legs longer for less. Less time and less money, if you account for the cost of waxing or buying shaving supplies over a year’s time and shopping for such things. That’s not even figuring in transportation costs, tipping or shipping fees. Your time is worth something, too. Why not spend less than 20 minutes getting rid of hair with an epilator once a week (at the most-I get 10 days completely smooth) in the privacy of your own home with a device that does double duty? The Silk-Epil 7 Skinspa removes the hair gently while it massages your skin. It thoroughly exfoliates to cut your risk of developing ingrown hairs and makes your skin feel smoother and softer, too. With the Smart Light feature you can use the Braun 7921 anywhere and get all the little hairs (as small as a grain of sand) in one or two passes. Then simply wash it thoroughly and let it dry overnight before you recharge it again. There’s no rush to recharge because you will be hair free for days and days. I only found consistently good reviews for this model. Even people who had some problems with it being really painful (it can be at first, but the more you epilate, the easier and more comfortable it becomes) kept using it because it does such a great job. In fact, it consistently receives 4 to 4.5 stars from reviewers. Some issues people had with this Braun epilator are true of any epilating device. If you don’t hold the skin taught under your arms it will pinch it. Don’t use it the first few times dry because that is more uncomfortable. Using it in a warm shower initially makes it easier to get used to the sensation of the hairs being plucked out by the roots. Over time the hair grows back slower and thinner making future epilation faster and easier. This is the perfect hair remover for someone who wants to spend less time on personal grooming by combining hair removal with exfoliation. I use the brush on me heels and elbows to keep them soft too. It’s totally portable for travel and you can use it anywhere, not just in the shower. 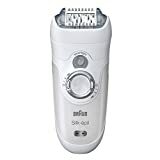 I give the Braun Silk Epil Female Epilator se7921spa my highest recommendation because of the ease of use, and great long lasting results. The vibration as it removes hair feels good and lessens any discomfort. The densely bristled brush exfoliates really well, which is essential for avoiding excessive ingrown hairs. Now I have more time to spend at the pool, the beach doing whatever instead of constantly shaving or waxing. Looking for something else? Check out my pick as the best epilator of 2016 here. Every woman wishes she could find that one product that can not only get rid of body hair, but can keep the hair and coarseness away for weeks. There are so many products out there that claim to do just that, but most of them are just a waste of money. 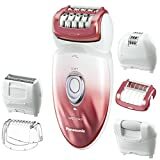 I have some good news for you: the Philips HP6576 Satin Perfect Deluxe Epilator really is a great device for getting rid of unwanted facial and body hair for women! It’s designed for the smoothest operation imaginable, so you won’t have to worry about rashes or irritation. It works wirelessly for up to 40 minutes after a quick one-hour charge. The head is washable for maximum hygiene. You can simply detach it and place it under running water. Let us take a look at some of the many benefits I’ve experienced by the Deluxe Epilator by Philips. With features such as the built-in Opti-light and pivoting technology, the finest hairs are revealed and eliminated. The performance cap is designed to pivot and contour against the skin. The ergonomic design enables the device to be kept at an ideal angle. A stretch bar lifts and prepares the hair for easy removal. The removal process is made smooth and easy thanks to 32 textured ceramic discs, which grip the hair and prevent any strand from getting away or slipping through. During the process, the Philips Epilator utilizes a massaging system to gently vibrate and stimulate the skin. The speed control technology maintains the ideal speed through the hair removal process, although it can be manually controlled as well. The hair-lifting technology also allows for flat-lying hairs to be removed. A razor and trimmer are both included to provide a smooth shaving and trimming experience. The tweezers are stylishly designed and come with the aforementioned LED light for illuminating the eyebrow area or any other part of the face or body so that you can see every last hair that needs to be removed. In addition to the eyebrows, you can also remove hair in areas such as the upper lip, bikini area, back of knees, etc. The discs, which are hypoallergenic and made of textured ceramic, are designed to remove the hairs comfortably. You can finally get rid of annoying hairs in such places without any discomfort or pain! There is no need to spend a bunch of money on regular wax jobs, since you can eliminate unwanted hairs on your face and body yourself. The process is simplified, and the results last for up to four weeks. You also won’t waste any more money on products or creams that don’t work as effectively as the Deluxe Epilator. You don’t have to keep it in the bathroom. The cordless operation means that you can just toss the device in your gym bag or suitcase and take it with you wherever you go. In short, the Philips HP6576 Satin Perfect Deluxe Epilator is a versatile device, with its hair lifter function, massage system, cleaning brush, trimming comb, and intuitive tweezers with lights. The charger, storage pouch, and cleaning brush are included. The best-selling Epilady 4th Generation is the faster, smoother epilator that removes even the shortest hair by the root. Suitable for face and body and leaves skin smooth for up to 4 weeks. The Epilady Legend 4 comes complete with an adapter, Perfect Angle guide, storage pouch, cleaning brush, and instruction manual. A firm and non-slip hold is ensured by the ergonomic design including rubber touch at gripping points. It offers two operating speeds for your convenience and for different types of hair. A Perfect Angle Guide is included to make sure you achieve the best epilation results right away. Convenience of using corded or cordless. Efficient: you can do more than 2 full epilations with one charge (60 minutes). Epilady Legend reviewers say it is a great improvement from the earlier prototypes of Epilady, and say they are ‘silky smooth’ from head to toe. Another Epilady reviewer recommends the product wholeheartedly, saying it works very well for coarse leg hairs. Some reviewers indicated that hair removal was painful with Epilady Legend 4, but it is hard to tell if this would be the case with any epilator they used. One reviewer remarked that after a few months this epilator did not hold a charge anymore. Another reviewer said it was difficult to get the right angle when using the Epilady Legend in certain areas such as the bikini area. It has been noted that this model of Epilady glides less smoothly over the skin than previous models. Ingrown leg hairs were a problem for one reviewer, and another found that it was less effective for thick leg hairs, which was very painful. 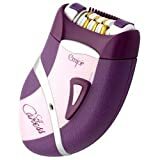 This epilator has received a large number of top epilator reviews with a 5-star rating on Amazon. Surely this indicates that the Epilady Legend rechargeable epilator is a winner. There are only a few negative reviews, and these tend to relate to pain management, and there’s no denying that even the best epilator will not be completely pain-free, and people differ in their tolerance for discomfort. It is also an affordable epilator and is likely to be within your budget.